CHOCOLATE has been on my mind lately. I've been having some pretty major pregnancy cravings for anything sweet and chocolate seems to be the one thing that never disappoints. Wouldn't it be nice if I craved carrots and celery instead? 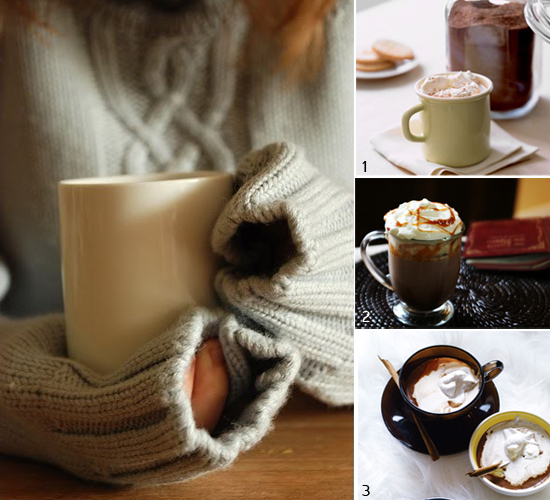 Well yes, but...then I wouldn't be able to try one of these wonderful homemade hot cocoa recipes and life would just be too boring. Sadly I crave chocolate on a regular basis as well as sherbet but I'm not pregnant. I think I maybe doomed if we ever decided to have children. I know I always wish I would crave an apple or something instead of chocolate. Lately I've been drinking so much hot chocolate. I've been adding in peppermint mocha creamer - it is so good! I just happen to have all the ingredients for Salted Caramel Hot Chocolate on hand - yessss!